A climb from Forest-in-Teesdale up to Chapelfell Top and Fendrith Hill, two of the high fells on the Teesdale / Weardale watershed. A mixture of good tracks and rough moorland walking. After a good run of walks in the North Pennines in the first half of the year I hadn’t been back since a fine walk on the Warcop Range back in May. This then was a welcome return to the area. In particular I was hoping it would provide me with added impetus to launch this website, work on which had also lapsed for a few months. Joining me on the walk was Paul, a regular walking companion when I’m out in the North Pennines and the northern Yorkshire Dales. The last time I’d visited Chapelfell Top and Fendrith Hill was back in 2007 when I’d also included Westernhope Moor in the walk. On that occasion my friend Matt and I had climbed up from the minor road in Swinhope on the Weardale side of the watershed. This time I wanted to see what the approaches were like from Teesdale. Starting from the parking area just below the school in Forest-in-Teesdale we took the small lane climbing up past the school and onto a farmhouse. At a badly signposted junction of paths we continued straight climbing north on a good track over pastures. Arriving at another crossroads we made a short detour to visit High Hurth Edge. There are not too many crags in this area so High Hurth Edge does stand out. I was also interested to check out the caves marked on the map. The edge is split down the middle by a fence. We stayed on the southern side so may have missed the caves. Unexpectedly we bumped into another couple of walkers (the only ones we saw on the entire route) who said there was actually a substantial cave system below our feet. Returning to the crossroads we turned left to pass through a gate and continue uphill on the open moor. The path, while not perhaps as firm as that suggested on the map, was still clear and the gradient fairly undemanding. It was a disappointingly cloudy morning and as we approached Church Bowers the base of the cloud began to caress the fellside. Church Bowers itself features a couple of prominent cairns and the remains of an old quarry. From Church Bowers we continued north across the now pathless moor. Sticking to the 610-620m contour lines we headed for the more substantial quarry remains on Harthope Bank. From a distance one particularly large spoil heap looked like the remains of an old Iron Age hillfort. At the quarry we gained a good track between spoil heaps on our left and the main quarry on our right. Just above the latter we had a view of Fendrith Hill which made a brief appearance out of the clouds. We followed this track until it reached the high road linking Langdon in Teesdale and St John’s Chapel in Weardale. Turning right we walked to the top of the road and on to visit the substantial quarry at Harthope Head. Here we descended part way into the quarry to take shelter from the wind and have our lunch. The quarry was clearly used by some as a dumping ground. A few feet away from where we ate lunch was the remains of an old television. After lunch we returned back to the road. Turned briefly right to gain the fence and then turned left to follow this uphill on to Chapelfell Top. 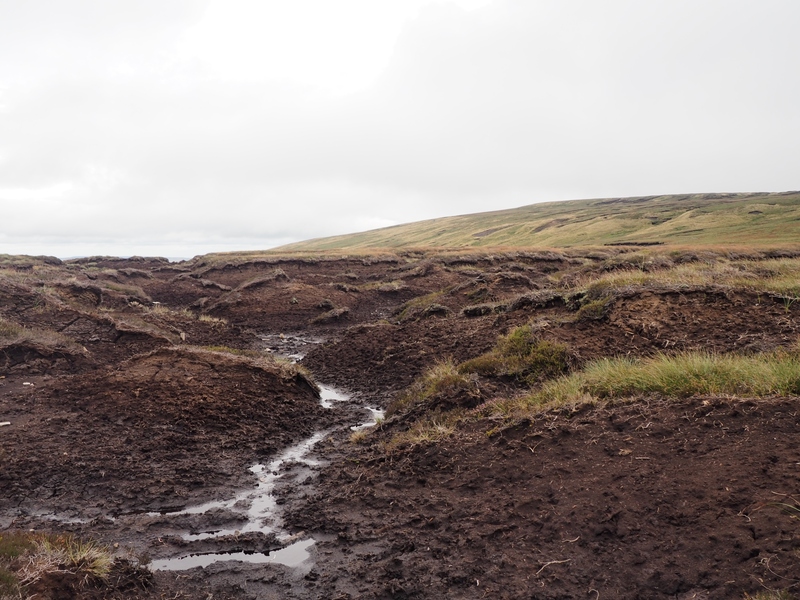 This was the roughest section of the walk requiring plenty of navigation over the peat hags and groughs. Finally we reached the small cairn on the summit only for the views to be obscured by cloud. From Chapelfell Top we turned south to head for Fendrith Hill. For the most part there is an odd ditch or depression which can be followed. Sometimes it was drier to walk in the depression, other times it most definitely was not. Upon reaching the trig point on Fendrith Hill we were greeted with the same lack of views as Chapelfell Top. Heading east alongside the fence we passed the ski tows on Swinhope Moor and then over the minor bump of Dora’s Seat. Here at last we began to finally get the odd view down into the side valley of Swinhope. We followed the fence all the way to the Westgate to Newbiggin Road, another of the high crossings between Teesdale and Weardale. Turning south-west we then attempted to follow the path which is now marked on the map as part of the Pennine Journey route. For the most part there was very little sign of an actual path. The going underfoot was not particularly easy but solace was to be had in the improving views over Teesdale. The most interesting feature of this section of the walk was the shooting cabin below Black Law. The cabin itself is now a ruin, it looked like the big bad wolf had blown it over. All that remained was the chimney and iron stove. Descending from the shooting cabin we came to a wall and finally on to something resembling a path. The walk concluded by generally following the Pennine Journey route back to Forest-in-Teesdale. Belatedly the skies began to clear and we enjoyed some nice sunshine at the end of the walk. Whilst it was a shame that it had taken so long to clear it had still been an interesting walk. Certainly the route of ascent via the various quarries had a great deal of interest. I was less keen on the way back down though and I’m not sure anyone attempting the Pennine Journey will thank the creators for routing the way along these particular ‘paths’. Wainwright himself, it should be noted, actually used the road.